All across the country Medicaid Modernization RFP’s are flying off the shelf leaving vendors to ponder how they can best position their solutions to maximize these opportunities. What most vendors don’t realize is that the Centers for Medicare and Medicaid Services (CMS) has already given them the roadmap to make it happen. 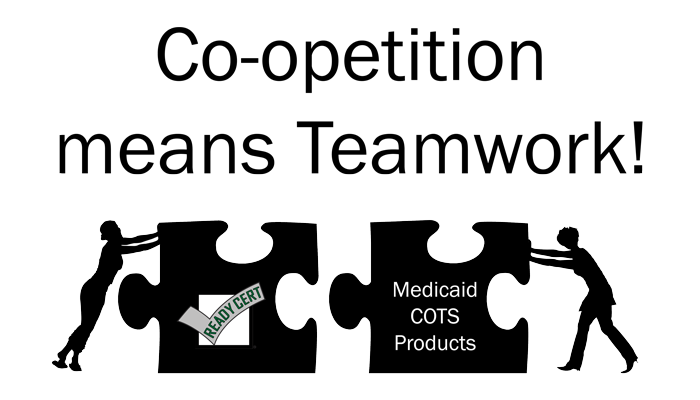 The Medicaid Information Technology Architecture (MITA) initiative prescribes a Medicaid Enterprise consisting of at least 10 major business areas and 80 business processes, each of which may be performed by one or more commercial off-the-shelf (COTS) products. The potential to mix and match these solutions in an enterprise are vast. Herein lies the opportunity to team (co-operate) with companies that normally go after the same business you do (competition). Let's say your firm's speciality is Eligibility and Enrollment, but you have developed other solutions to augment that specialty. Determining what you're best at is the key to determining what role you play in the enterprise. the question is, how do you do that? The first thing one should do is determine how their core offering matches up against the MITA requirements. This is called a Vendor Self-Assessment (VS-A). Comparing a solution to MITA, documenting how the solution meets (or misses) the requirements, and rating the maturity of the solution helps define a company’s “sweet spot”. Once the sweet spot is determined, the GAPS from the VS-A will clearly show what processes can/should be left to your competition. This is a true Best Practices/Best of Breed approach. So, before you decide that your company cannot “prime” a Medicaid modernization project, do a VS-A, know your limits, get to know your competition (or potential teaming partners? ), integrate your offering with other solutions, and keep your friends close and your competition closer.